This is a gorgeous bubble tunic dress. 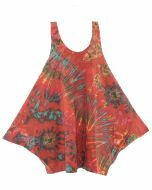 It can be wear as a mini dress or tunic. 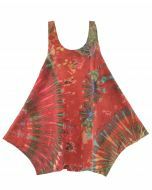 The garment was hand dyed individually with beautiful colors. No two pieces are exactly the same. Inner pocket can be formed from the side fabric. The extra fabric at the side create the bubble style. Notes : As this item has not been pre-wash, smell of dye might be present. Dye smell will be gone after wash.